Heading out in the winter on Canada’s highways can be daunting, especially if road conditions aren’t optimal. Those snowy whiteout conditions can mean life or death if you don’t know what you’re doing at highway-railway crossings. In order to feel confident behind the wheel and near the tracks, Operation Lifesaver is here to help. 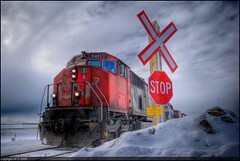 We’ve captured some quick winter driving tips that will help you stay rail safe near the tracks. Always drive at a speed that allows you to stop within the distance illuminated by your headlights—so you have a clear view of the road ahead of you. Before you proceed, make sure that another train is not approaching the crossing on another track in the same or opposite direction. These are just the tip of the rail safety iceberg. If you’re looking for more winter rail safety articles or helpful tips, Operation Lifesaver has a wealth of engaging and insightful resources available with a simple click of a button. This winter, it’s up to you to stay rail safe. Let us help you get there. Look! Listen! Live!